Robert Kubica says he is continuing to gain confidence the more he drives current F1 machinery, following his latest outing in Hungary in-season testing. Robert Kubica says he is feeling more “familiar and confident” driving current Formula 1 machinery than he did last year, following his latest outing during Hungary in-season testing. Kubica made his latest appearance in the Grove-based outfit’s current challenger in the final in-season test of 2018, as part of his reserve and development role - following outings in pre-season testing, practice sessions in Spain and Austria, and Pirelli tyre testing at Silverstone. Having returned to the scene of his official F1 comeback in a post-2017 spec car in Budapest, the Pole insisted he is feeling much more confident behind the wheel compared to his outing with Renault. “12 months ago I was here for the first time with Renault and after 12 months I can say everything is easier!,” Kubica said. Kubica racked up 103 laps for Williams on the second day of running at the Hungaroring on Wednesday, ending the day with the sixth-fastest time, which he set on Ultrasoft tyres. “We did have a bit of a mixed program with some data collection for next year and trying to understand how we can make the car work better for next year’s car. But we did do a few runs with a current specification car as well. So the feeling was good,” he explained. 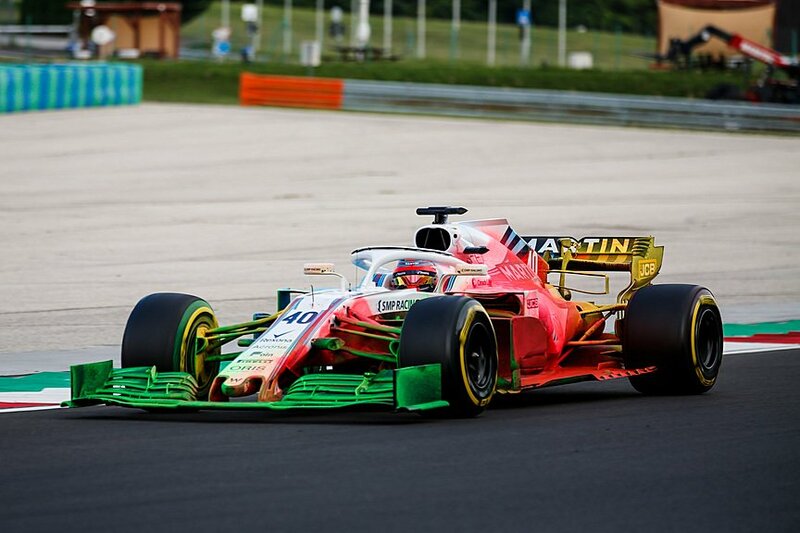 Ahead of the introduction of tweaked aerodynamic regulations for next year, Kubica also completed a run testing a 2019-spec front wing on his FW41, which featured an eye-catching and colourful mix of flow-vis paint. The change has been implemented in a bid to reduce the amount of dirty air being produced by the rear of cars, enabling drivers to follow rivals much closer on-track and increase overtaking possibilities. When asked if he felt it would be a good introduction, Kubica replied: “I don’t know, it’s too early to say.